...for inside this package was some of the most divine pumpkin bread I have ever eaten. Truly spectacular....so much so that this incident happened 15 years ago and I still make this bread regularly (I think about the source of the recipe as little as possible). 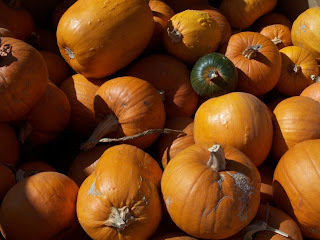 So, since I am very into pumpkins and we all have to eat, I thought I would share it. This recipe makes a ton (not literally, duh!) of bread or muffins. It is a great recipe for bake sales, teacher appreciation days, and other big group events. Now, if you read the story, you know this recipe did not originate with me. I have the original recipe this man gave me, but have no idea where he got it from. So, there you have it...he cannot come after me anyway... his questionable ways caught up to him! Lots of muffins! Just realized I never counted...oops! Last time I made this, I yielded 2 large loaves, 4 mini loaves, and 2 1/2 dozen muffins. NOTE: I am very "into" making recipes healthier...but have not tried using any other sugar substitutes or flour substitutes (I think brown rice flour would work well)...maybe later....for now, I am just enjoying some Unquestionably Good Pumpkin Bread and hope you do too! P.S. You may notice I use Jules's photo in (probably) way too many posts, but she is there and a good prop and Joe doesn't like taking pictures! Oh, This story and THIS recipe of sweet Pumkin Cake reminds me so much of my time i spend in NY such a long time ago.....! The Lady of the house did bake some cake like this; I still have the recipe....it's almost the same!!!! I LOVE PUMPKIN BREAD!! I'm gonna have to try this recipe - as soon as the weather cools down. We had two rainy days in So Cal and then it got warm again. I'm ready for fall. And pumpkin everything! Thanks for sharing - can't wait to try it! That's a lot of pumpkins as well!! Jules is beautiful! I love that picture of her! Hey, I use pictures of Daisy all the time, no worries! I am so excited for this pumpkin bread! Oh Pumpkin bread...how I love thee unquestionably! Can't wait to make these for my son's classroom Thanksgiving celebration. I have never had pumpkin bread, but the kids are carving today. Karma has a way of catching up with the questionable and there is no questioning that I am going to try this recipe!!! I love that you use your family as "props" and Jules is too precious to pass up! That is why I love little ones because the still love to have their pictures taken! 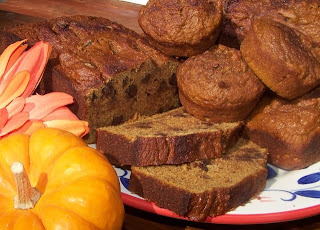 My mom is coming to visit with us on Friday and she will bring along her banana bread (she always does)...and this time we will great her with pumpkin bread. Thanks! Yum! Sounds delish, I can almost smell it! 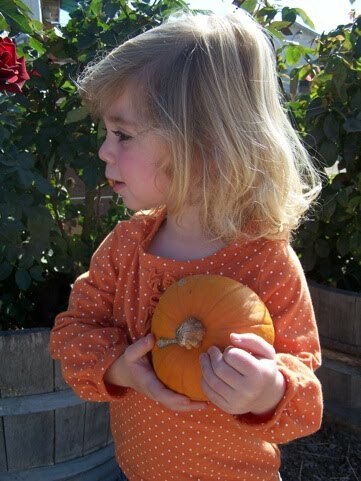 As far as your little pumpkin goes- I understand! Baby girl is always ready willing and able to pose for a picture, the others? Not so much!She looks like a doll! Okay...I'm not so bright this morning...I was reading unquestionable ethics and then I swear it said he ENJOYED unquestionable men...couldn't get past that!! It looks delicious no mater where the recipe came from! I love anything pumpkin and am partial to my own recipes; however, this one looks really good and I love that yours calls for applesauce instead of oil! I'm going to be trying this soon. Just the thought of this bread with some pecans in it are making sooo hungry! Oh...and fabulous new blog look! Way to go!! Hi Holly, love the story! Hey, why have I never had a slice of your famous pumpkin bread? I demand a Happy Hour! P.S. Dig the new background! THIS is what I like about Fall...pumpkin bread. It should be it's own food group! This recipe looks delicious and I will be trying it! My mouth is watering just thinking about it!!! My favorite bread! I love it warm with butter.. yum. I will try this recipe. ooooh! I want! I want! Thanks for sharing! need to try this. i will have to share my pumpkin cookie recipe with you. they rock!